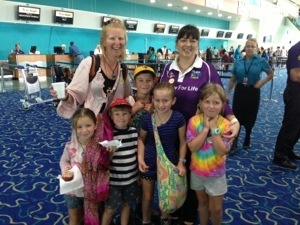 Leaving Cairns it was the biggest morning tea raising money for cancer research – lots of great food – & this lovely lady called ‘Nanny Berni’ wanted to come with us & look after the kids – bless her! Palm cove with our ace cousins! I have had the best week with my cousins. There are Aaron 14, Ethan 12, Laura 12, Marcus 7, Elinor 5, Perry 4 and Angus 3. We have played tons of pool table and we have also played in the pool. We all came to Palm cove, we come to Palm cove for family holidays every year. Pa and Grandma pay for everything – they are so generous i think they do it because they love seeing all there grandchildren having fun together and they also love spending time with them all. I loved lunch where we had wedges and chips. I LOVED the wedges with sour cream and chilli sauce. We went to Cairns tropical zoo it was fun, we got to feed the kangaroos and pat them. Cairns tropical zoo is the 11th zoo I have been to in my life, my 12th zoo is Singapore zoo we are going there on the 30th. I love the birds and koalas. I especially love the Reticulated python it was 8m LONG and took nine people to carry. I bought a egg that had a fake baby croc, I left it in water for three days and it hatched into a baby croc. On Friday night we watched Collingwood play Sydney, while we were watching I had two drinks they were soda lime and bitters and lemonade. Yum! Me and Pam watched the last 10 minutes of Hawthorn play Gold Coast. We played pool table everyday and played in the pool everyday. For the dinners we had pizzas, Greek food, we went to the surf club, had fish ‘n’ chips and also we went to. P.S I had to ask something in Greek Dad said ” nobody is going to have dessert unless Toby orders in Greek”. So I did. On the 22 of may it was my birthday -Toby & I Turned ten. We went to a water park. the waves and floating over the waves. At the water park we went down big slides – one was red, one was blue and a yellow one. The red slide was pitch black. For lunch we had Mexican & for dinner we had sushi. We went to Kakadu and we saw lots of rock art. Then we went up the rock to watch the sunset. Lots of other people were there – it was gorgeous. That night we didn’t bring our fly as we are staying in Darwin and left it there so we all got soaked in the meddle of the night – we had to sleep in the car it was SO HOT. In the morning we got ten liters of water out of the tent then we went back to Darwin. When we arrived, our cousins Lachie and Josh were at school, Jenny and Paul were at work. Wendy (visiting from Victoria) came out to greet us, when we went inside we found our cousins Ruby and Emma and their dad Mike. Five minutes later our cousin Josh came in and within 5 minutes he was off to Woolworths for work. We decided to go and play in Paul and Jen’s pool. We played for about an hour until Lachie came in to play Marcopolo, then we played ship and submarines and we played octopus – it was fun. Dinner was awesome it was potatoes, salads and sausages…. Edith falls was so much FUN. We camped the night at Edith we set up the tent. This is our camp site and the ‘dinner table’ that Kiki set. In the morning we did the walk to the falls. Toby and I climbed up and up a cliff Toby thought we could get over to the other side through the rapids “he was crazy to think we could cross it alone”. So we went down the cliff. When got back down we all went down the rapids “FUN”. On our way to Darwin we saw a Rock wallaby someone had just hit it – the wallaby had a joey in it pouch. My mum tried to get the joey but the Rock wallaby jumped away the wallaby was OK she had blood dripping from her mouth. So we turned up at mum’s cousins house. The First of the Lasts……. Wow – this is quite surreal as I sit here tonight – fans going to try to keep the mozzies at bay – apparently they don’t like moving air – though I am pretty sure that Darwin mozzies have adapted to even that – and thinking about tomorrow……. Tomorrow – or actually today really cause it is after midnight – my big kids Tobes and Yas turn 10 – and I think how quickly those years have passed and how quite possibly they have spent more than half the time they live with us before wanting to move out, study, adventure etc already. That is quite scary really as there is so much to show them and teach them and share with them. They have chosen to have a water fun day in Darwin at the free water slide park (very impressive – maybe Darwin does this as they cant swim in the sea due to crocs?) and then the wave pool in the afternoon. Oh and yeah – we have sold our car – I had visions of us being stuck in the Pilbara or the Kimberley with a car that was breaking down and losing many of its working bits – though – NO – thanks to our trusted mechanic Grant –it got us to Darwin – over 10,000km and then we get to sell it to someone – who apparently is quite excited about it – despite – the no air-con, no side opening door, no back windows working, dints in the roof due to us clambering on to load our gear up on the roof, and now even the radio, CD and car charger losing its gusto! Sandy did an amazing job answering questions etc and selling the car on gum tree while I was in Melbourne for 4 days recently to do some teaching. I think I might shed a bit of a tear when we give up the car tomorrow – not only did Sandy sell the car but she negotiated for it to be picked up from in Darwin while we are at the wave pool – to minimize having to have taxis etc. It is quite difficult to get lifts anywhere for our family due to the numbers and we haven’t had to use any taxis yet – they add up – especially when it has to be a maxi-taxi to fit us all in. So we pass on the car tomorrow afternoon and then stay in town tomorrow night at a backpackers to enable us to get to our 6.30am flight the next morning to Cairns. We are all so looking forward to going to Palm Cove (near Cairns) with all the King (Sandy’s family) clan – of course we love spending time with them – though the kids just adore their cousins and when all twelve are together they just play and play all day and we get to relax a bit more than usual. However – once those 6 days are up – then it is off – really off – off to Asia – to traverse our way across the biggest continent on earth – and that feels a pretty exciting and scary all at once. It’ll be such a different stage for us – without a car – in a countries none of us have been to – amongst languages none of us know (though Kiki thinks she has mastered all the colours in Mandarin!). This brings me to the title of this blog – the first of the lasts……. For the least couple of weeks we have been saying – Oh – this is the last day we’ll be in Western Australia, this is the last day we’ll be in the tent (oh by the way – if you are tempted by buying a 10 person tent from Aldi and actually want to use it more than 10 times – don’t bother – we have had to throw ours away and now a bit embarrassed that we were accomplice to the huge throw away society we have become – such a terrible waste of resources – best to buy good quality if you want it to last – the tent had to be repaired so many times and by the end the poles were just so broken we had to laugh). The last night staying with cousins Jen and Paul, tomorrow will be our last day to drive our beautiful Tarago, the last time Yas and Tobes will be single digit age, the last time we will have an address to get letters for a long time, the last time we will be allowed to drive at 130km/hr, the last time we will be bitten by these crazy mozzies – its exciting and sad to have ‘lasts’. Also – in many ways terribly exciting to go through yet another downsize of our stuff – so much needs to go to the op shop tomorrow…….and yet – we are still due for at least one more downsize before we fly off to China (via Singapore). Last week I flew home to Victoria for four days of teaching and to visit my clinic – Sandy stayed up here in Darwin and visited Kakadu amongst selling the car. It was quite strange to get to a place where shoes were a must and you needed 3 layers of clothes to feel comfortable – and that you had no need to fear mozzies! It was so much to see many of the wonderful students I have enjoyed teaching over the last few months and to catch up with friends. I managed to fit in a musical, a movie, a birthday dinner for my wonderful friend Robyn, and a boys’ night out organized by Pete – that left me with a sore head! As surreal as it was to fly home to Melbourne briefly – as soon as I flew back into Darwin I instantly reveled in the heat and felt I was home – I guess cause I was so excited about seeing my family again. My gosh – look at the time – definitely need to go to bed – exciting birthday times await in the morning.